A group of nineteen students with four staff members. The four staff members on the far left are John A. Harder, George Sukkau. and on the far right are: C. C. Peters, Isaak Dyck. Students are back row (left to right): Jacob A Loewen, Peter Friesen, ? Stobbe, Alfred Hamm, Dave Braun, Abe Ewert. Third row (left to right): Henry J, Isaak, Rudy Goetz, Henry Warkentin. 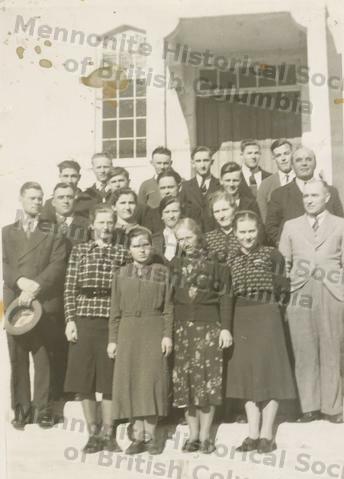 Second row (left to right): Helen (Toews) Wolfe, Melita (Krause) Peters, Nettie (Esau) Wiebe, Erna Voth. First row (left to right): Agnes (Isaak) Spenst, Louise (Riesen) Matties, Helen Reimer.